Lanzillotto, Annie. 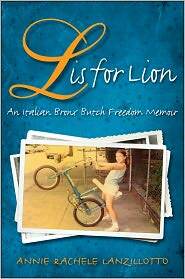 “L Is for Lion: An Italian Bronx Butch Freedom Memoir”, SUNY Press, 2013. Annie Rachele Lanzillotto was a tomboy in the Bronx who grew up in the 1950s. She had a rough childhood which consisted of watching the boys play stickball on the street and seeing her father beat up her mother. Just as she was to begin her studies at Brown, a massive tumor was found in her chest and her life became a battle for survival. This is the story of a lesbian coming of age and unlike anything I have ever read before. It is a story of courage and perseverance and it is true. Annie is one of a kind— a butch Bronx Italian who grew up to be a performance artist and cultural anthropologist and a wonderful writer who will keep you reading page after page. We go with her to the Bronx, to the Ivy League, to the cancer ward, to Cairo and to Italy and we meet the essence of an Italian American who can be poignant and brutal at the same time. She writes with humor and moxie as she tells us who she is and we fall in love with her. She writes from the soul of a girl with humble beginnings and non-traditional sexuality who has to fight to me—whether she fights society or cancer, she is determined to win and as she does she introduces us to an amazing cast of characters which includes nuns, football players, a CEO, a battered housewife and the asthmatic scholar athlete, the author. Annie (if I may) did not let anything or anybody keep her down. She came from an abusive family and she turned to books and education as an escape. Her battle with cancer is something we can only read about and when she thought she had beat it, it returned some years later. She realized her own limitations and she fought with her own mortality. She questioned her self-worth as she looked for love and she dealt with the results. Annie shares her life with us and she is honest and candid. As strange as it may seem, I feel as if I have made a friend as I read her story. She was not a quitter and she battled adversity, illness, rejection and stereotypes and she emerges as a unique person. If I could have done just a little of what she has done in life I would be ecstatic. Annie tells it like it is and she does so well that I was sorry for the book to end. It is not often that a book can make me laugh aloud and shed tears on the same page but Annie did that. Combining emotion and experience Annie gives us a book that is hard to forget. This entry was posted in GLBT memoir and/or biography, GLBT non-fiction on March 6, 2013 by Amos.